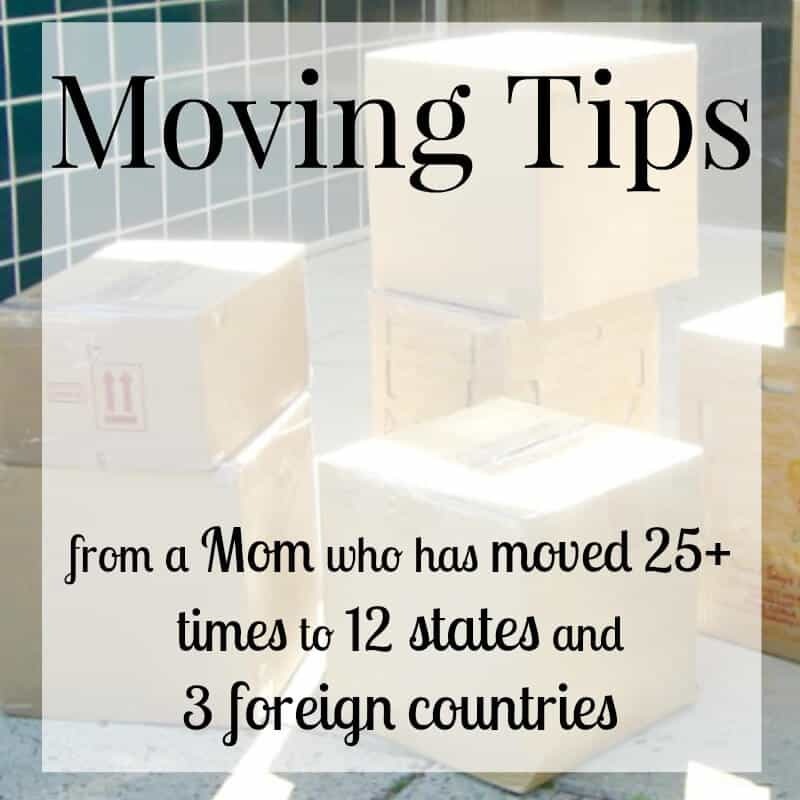 I’ve moved more than 25 times to homes in 12 states and 3 foreign countries. Along the way I’ve picked up tips that make moving less stressful and more successful. 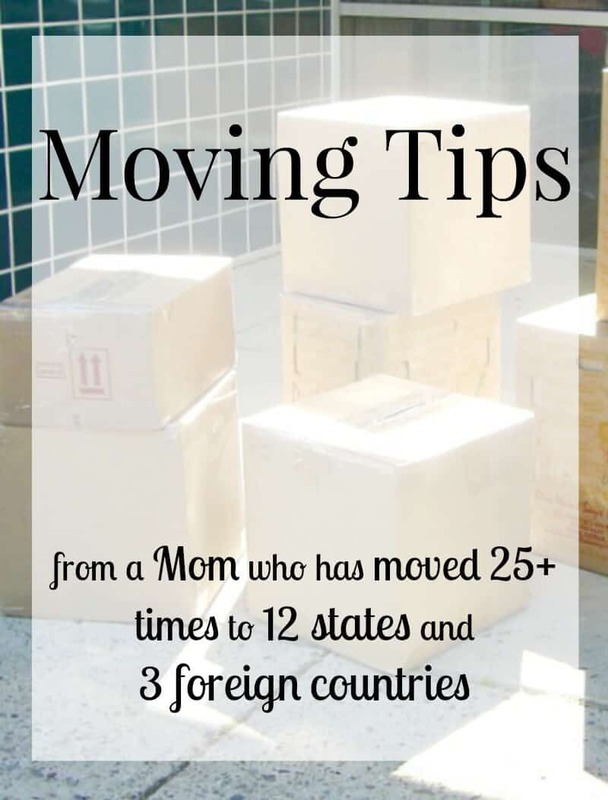 Here are the best of my moving tips & tricks advice from a military mom that has moved more than 25 times. Whether you’re moving across town or moving across the country, these organizing a move tips are for you. Get 7 free checklists to help you find the perfect home for your family whether you’re moving to a new city, state or country. Find the Best Place to Live – Whether you’re moving across town or moving around the world, these tips will help you find the best home for you and your unique needs. 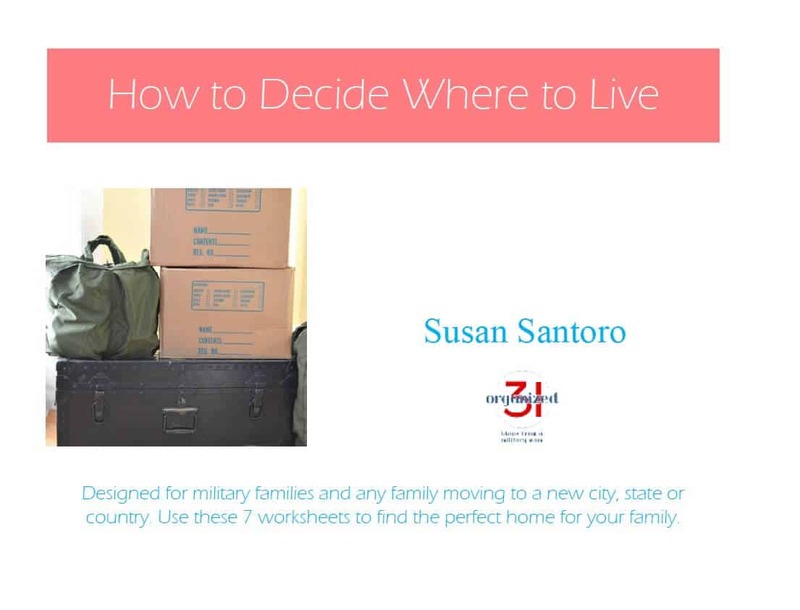 How to Decide Where to Live – Part Two of my series and includes 7 free printable worksheets to help you find the best home for you. 10 Tips for Moving Yourself Across Town – Moving across town can be almost as challenging as moving across country when you’re doing the work yourself. These 10 practical tips for moving yourself across town has come from my own experience moving my family and also helping move friends across town. Items Movers Cannot Accept – Do you know what items can be packed and moved by movers? Knowing these prohibited items will make your packing and moving days go so much more smoothly for you. Military Moving Tips – 10 Tips for Living Happily Through a Move – Moving makes the list of the top most stressful Life Change Events. Many folks rank moving much higher up the list because we do it more often than other evens listed. There’s no debate that moving is stressful. These Military Moving Tips apply to military families and any family that is experiencing a relocation. You can make your move less stressful and even enjoyable. Tips to Make Military Move-in Day Easier for Kids – Moving can be particularly difficult for children. They don’t have the reasoning skills, big picture view or experiences that adults have to aid in processing the impacts of a relocation. I’ve moved as a military child and as a military mom. 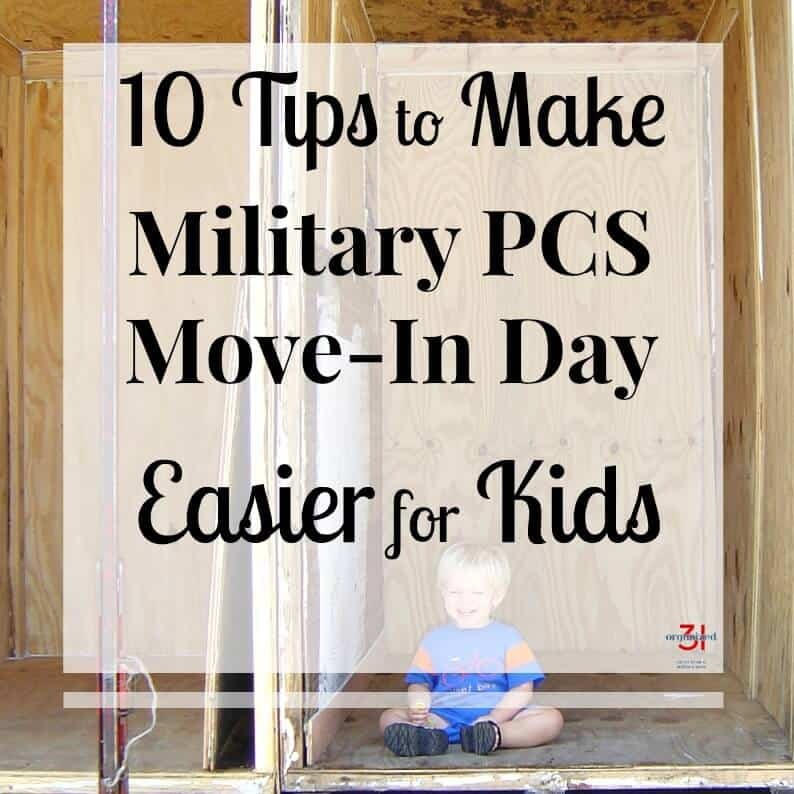 These tips to make military move-in day easier for kids are gleaned from my personal experience and apply to all families facing a move-in day. Moving with Your Dog – Moving with a dog can be stressful for you and your pet. But it doesn’t have to be with these tips for moving with your dog from my experience in 12 moves with my dogs. Get your What to Pack free printable checklist. Military Family Moving Tips Everyone Can Use – When you move every one to three years, military families quickly learn how to make moving go a bit more smoothly. Whether you’re moving into your first place or across the country, it really can go smoothly. How to Fold Curtains and Organize for a Move – There are simple tips that really do make a big impact on making moving easier. 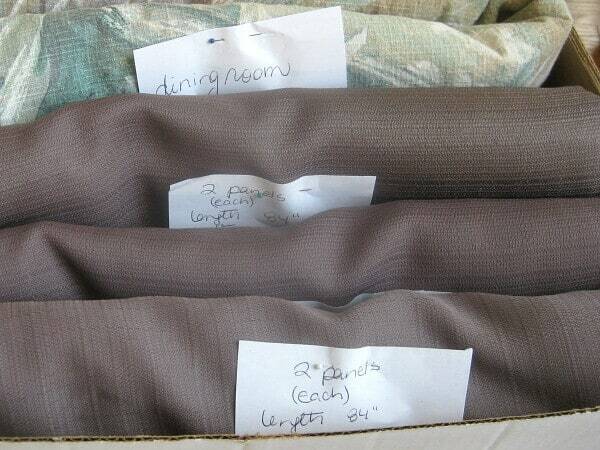 These tips on how to fold curtains and organize for a move is one of those simple tips. At one point we moved five times in six years with young children. Having curtains available the first day for privacy is critical. You don’t always have the time or budget to run out and purchase new. Packing Moving and Storing Shoes – Another simple moving tip that makes a big difference is this trick for packing, moving and storing shoes. We discovered it when moving my baby to college and it’s been quite popular with my readers and my family. 10 Tips for Setting Up a Temporary Kitchen – Often when moving you have to live family life with a temporary kitchen set-up. Family life and meals must go on no matter what your kitchen situation is and whether all your dishes have arrived yet. These tips for setting up a temporary kitchen I learned over those 25+ moves and I used them recently during a kitchen renovation. 105 Tips for a Successful Relocation – Six moving experts, yours truly included, shared their top tips for making relocating less stressful and even successful. You’re bound to find at least a handful of helpful hints among these 105 tips for a successful relocation. How to Pack Clothes for Moving – Throwing clothes into a box in exhaustion will work, but taking a few extra minutes to get organized will make your move much easier. These tips on how to pack clothes for moving have worked well for my family over the years. Packing Christmas Decorations to Survive a Military Move – Christmas decorations and all holiday decorations are usually precious to a family. I’ve learned how to pack our decorations to survive a military move (we don’t get the white glove, premium moving experience) and those tips will help protect your precious decorations in a move. How to Store Your Decorations to Survive a Military Move – Storing your decorations is just as important as packing them. These tips for how to store your decorations will keep them safe the 11 months out of the year when you’re not using them. Portable Storage – 10 Things You Need to Know – Whether you’re moving across town or across the country a portable storage unit may be the perfect answer for you. With these tips, you’ll know what’s key to making it work successfully. 6 Reasons You Need a Trip Planner – An old-fashioned trip planner really makes planning and executing a trip much easier. Grab your copy of my free Trip Planner for your next trip. 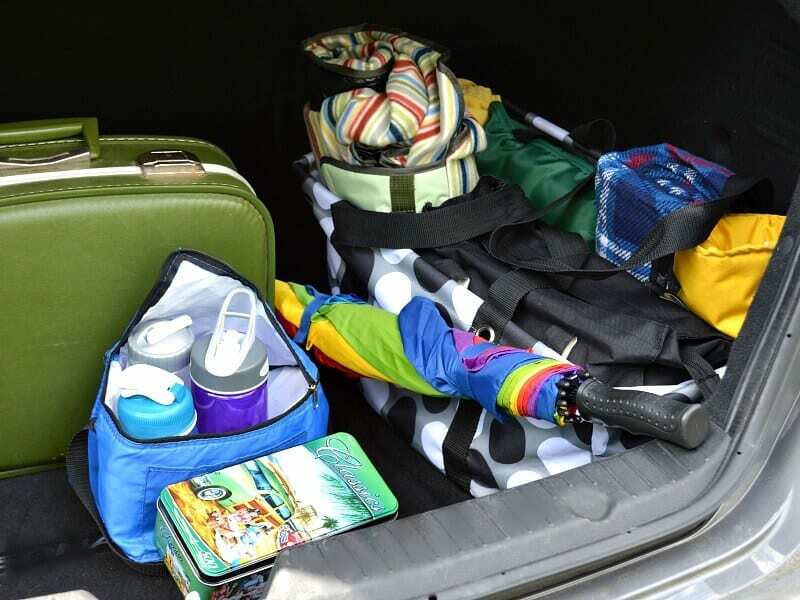 6 Summer Travel Tips from a Military Family – When you’ve moved with small children by yourself or a 50 pound dog by yourself, you pick up a few tips along the way. These are my favorite six tips for summer family traveling. Moving – Upstairs Room Checklist – I created this checklist after talking with another military mom about getting ready to move room by room. Use this free printable upstairs room checklist to make sure each room is prepared prior to your move. Moving – Downstairs Room Checklist – The second half of preparing your home for your move is preparing each downstairs room. Grab your free printable of the Downstairs Room Checklist now to prepare for your future move. 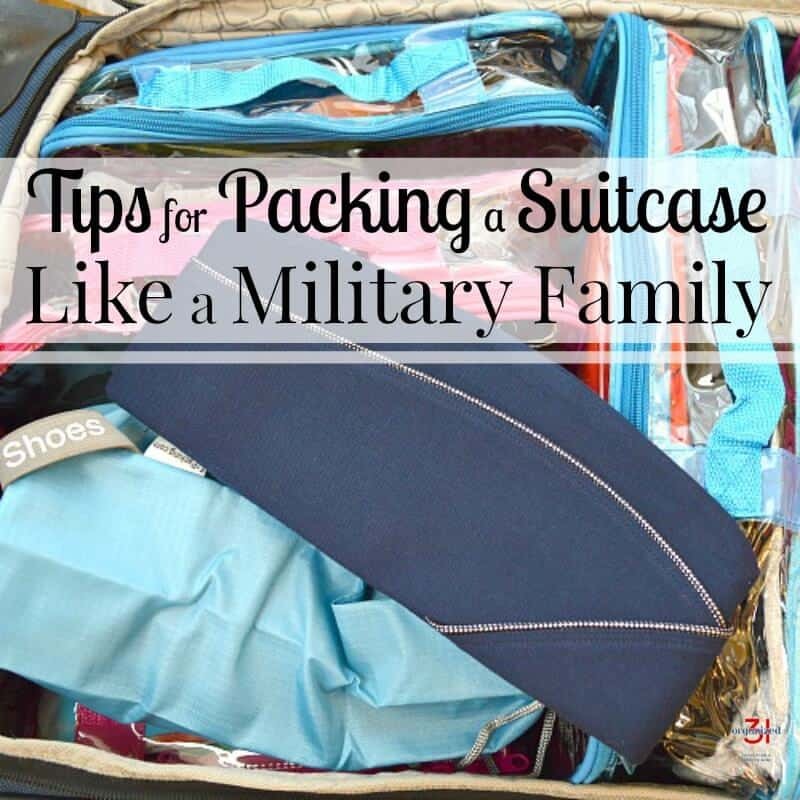 Tips for Packing a Suitcase Like a Military Family – With all the moving experience I’ve gained thanks to the military, I’ve picked up a bunch of helpful tips that I use in packing my family’s suitcases. These tips work equally well for moving or vacations. Move-In Cleaning Checklist – When we move into a new house, I always give it a good cleaning (our dirt is one thing, but other people’s dirt is just plain yucky!). Often the moving schedule doesn’t allow me to thoroughly clean the entire house before move-in day. My free printable Move-In Cleaning Checklist helps me prioritize my cleaning tasks so my family can feel comfortable in our new home immediately. Rental Move Out Checklist for Cleaning – When you move out of a rental property, you want to clean it well enough to get your entire security deposit back. 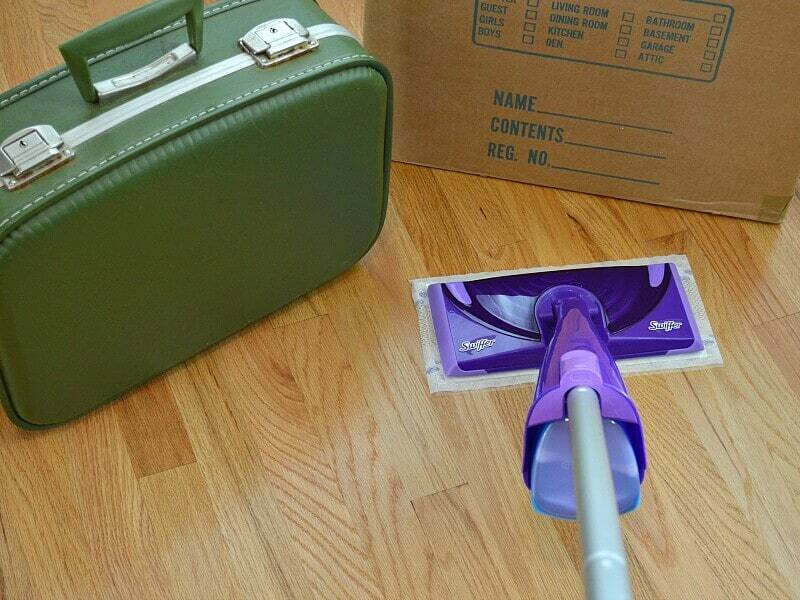 My free printable Move-Out Checklist for Cleaning will make sure your house is sparkling and your security deposit is returned to you with no arguements. Tips for Organizing Dishes – Knowing how to organize your dishes in your new home makes settling and feeling at home right away easy. These are simple tips that will turn that new house or apartment into a home. Saving in a New Space – Moving is an expensive proposition. These are simple tips for saving money in your new home. Moving into a New Home – How to Set Up Your Kitchen – When you move into a new home, the quicker you set up your kitchen, the quicker normal life can begin. There are tricks to knowing the best way to set up your new kitchen and where to place dishes, cups, pots and pans and other items to create the most efficient kitchen.